This version has similar functionality to the original, but the code is very different; the Oxygene version uses Java units instead of the Windows-specific WinGraph, WinMouse, and WinCrt. When implementing an interface such as KeyListener, you must include all of its methods in the interface and implementation sections even if a method is empty. We cast the Graphics object g to a Graphics2D object to gain additional functionality. We paint to a buffered image then copy it to the applet when all of the changes have been made. We compiled the applet with the command Oxygene g2d.oxygene. The Oxygene code g2d.pas, the project file g2d.oxygene, the HTML file including the applet and a screenshot follow. 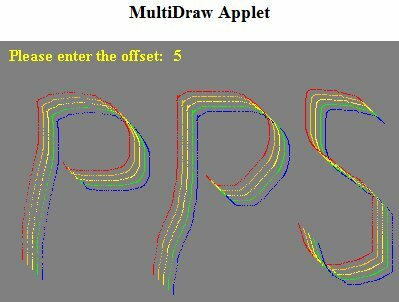 You can try the applet yourself here. Converted to Oxygene for Java by PPS. ( <font color="red">You need to enable Java to see this applet.